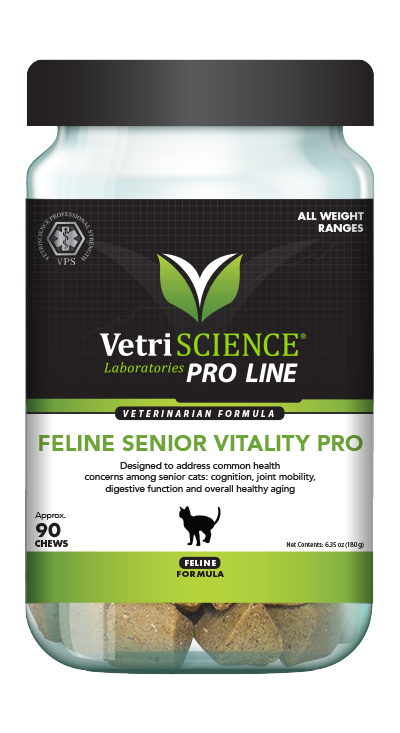 Feline Senior Vitality Pro is formulated for senior cats to address common health concerns by supporting cognition, a normal inflammatory response, joint mobility as well as proper immune and digestive functions. Feline Senior Vitality Pro contains a blend of 10 active ingredients to promote vitality and overall healthy aging in senior cats. Perna canaliculus, GlycOmegas brand Green-Lipped Mussel, has been clinically proven to improve mobility and comfort level in cats. Resverasyn, trademarked ingredient, and DMG support cellular metabolism and proper absorption. Taurine supports cardiac health. Choline may help liver and nerve function in addition to cognition and muscle movement. L-Theanine promotes calm behavior and reduced irritability. GanedenBC30 is the first probiotic ingredient to be non-GMO verified by the non-GMO project. Omega 3 fatty acids, Vitamin E and Vitamin B12 also play crucial roles in long-term health of aging cats. Available exclusively through veterinarians. 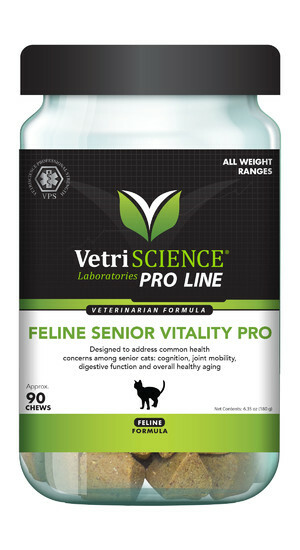 Ask your vet about Feline Senior Vitality PRO today! soy lecithin, sweet potato, vegetable oil, water.